There I was. Sitting there in our hotel room in the dark looking for a place to eat. It was nearly 10:00pm and the kids were asleep. Normally, that would mean pizza delivery or a quick run to McD's. But with the grandparents in the same 2-bedroom suite, it meant Viv and I could escape for some real food. 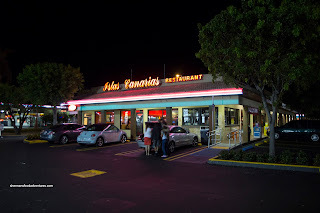 Since we were in Miami, it meant that Cuban was a good bet. 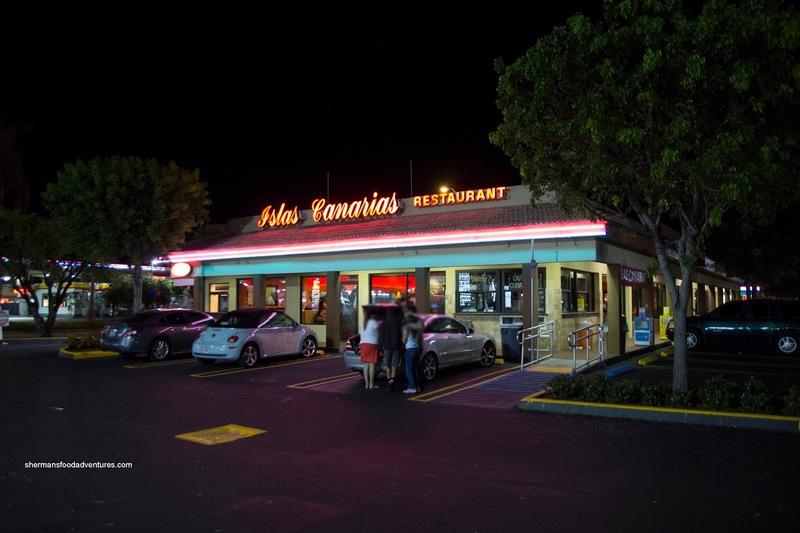 I briefly considered some smaller joints in Hialeah, but not really knowing the area, we took the safe route and headed over to Isla Canarias. 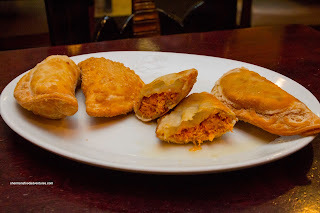 Since they were out of beef, we ended up with 2 ham & cheese and 2 chicken Empanadas. 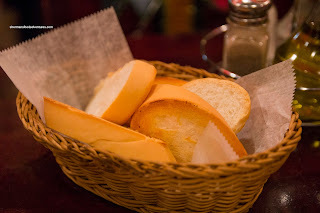 Although on the greasier side, we found the pastry to be really crispy and flaky. It was the right thickness where it wasn't heavy or overbearing to eat. 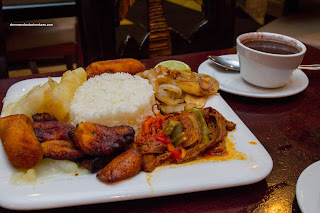 As for the fillings, the chicken was our favorite since it was moist and flavorful from the jalapenos and onions. The ham & cheese was too salty for our liking. I'm pretty sure that the flavor profile was pretty much so, but it was just not our personal favorite. We got the single portion of Shrimp & Chicken Paella which was a decent size and in a deep shade of yellow thanks to the Bijol powder. Hence, the flavour profile was definitely different from the traditional Spanish version (which uses saffron). That is not to say it wasn't good though. The plethora of onions and peppers afforded a certain sweetness and savoriness. 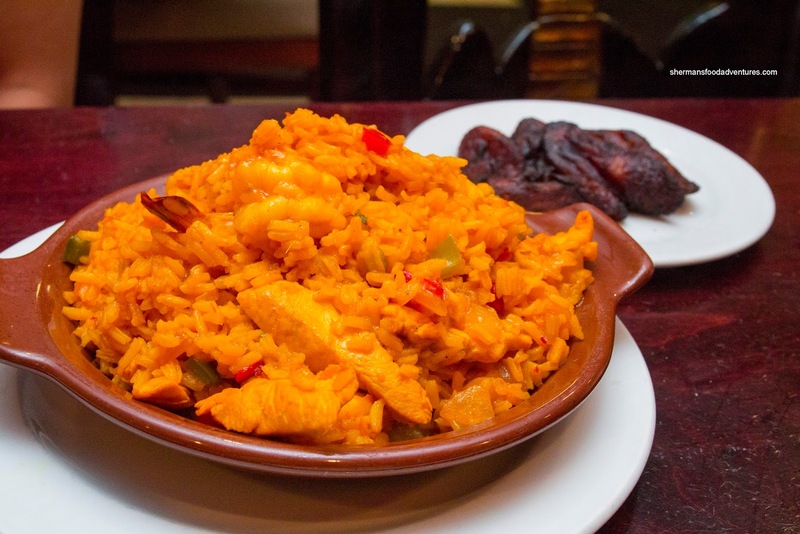 The rice was not overcooked while the chicken was sufficiently tender and the shrimp had a sweet snap. Lastly, we shared the Sampler Criollo consisting of roast pork, shredded flank steak Creole style, croquette, rice, black beans, yuca and plantains. If I had to compare, the roast pork was way better than that of the one I had at Padrinos. It was moist and I could really taste the pork. Although the flank steak was stringy and chewy, the flavours from the peppers and stewed tomatoes were intense and rich. The croquettes were not that hot nor that crispy while the yuca was a little firm. The same could be said about the plantains. In the end, we found the food to be decent here and it helped quell the late night munchies.